How to use public transportation in Paris and suburbs. Information for directions, fares and schedules. The Paris Metro (run by the RATP) is the quickest and easiest way to travel around the city, as well as the best value. 300 stations ensure that you are never far from a Metro entrance while in Paris. If you wish to travel to nearby suburbs use the RER regional express network (run by the RATP and SNCF). 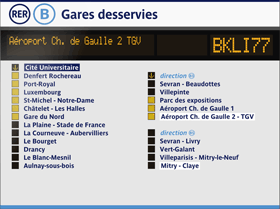 RER ″B″ serves Charles de Gaulle and Orly airports while Disneyland is served by RER ″A″ and Versailles by RER ″C″. If you need to go in suburbs that are located a bit further from Paris, or just not reachable in RER, you may need to use ″Transilien″ SNCF commuter trains (e.g to Chartres, Fontainebleau, Giverny,…). The Paris metropolitan area fits into zones 1-5. Central Paris is zone 1, CDG airport is in zone 5, Orly airport and Versailles in zone 4. Paris Metro is contained in zones 1-2 (except La Défense station in zone 3). Paris Metro has 16 lines, numbered from 1 to 14. The metro operates every day including public holidays from around 05:30 till 00:40 (01:40 on fridays and saturdays). RER consists of 5 lines referred to by the letters A, B, C, D and E.
The RER operates every day including public holidays from around 05:00 till 00:30. Each line has a color, which you’ll find on signs in the stations and on all maps. Metro line has two directions, indicated by the terminus station at each end (e.g La Défense-Château de Vincennes). RER signs indicate several end points because each line has different branches. Exit (Sortie) is indicated in blue. the final destination of the train and where it will stop. Tickets are available at all stations, from ticket offices or self-service machines. You can use a basic single ticket ″ticket+″ when travelling by metro, bus or RER (into central Paris only). For travel beyond central Paris (zones 1-2) RER ticket prices are determined station to station. Children under 4 ride for free. All tickets must be validated immediately on starting travel, access to train platforms is controlled by gate barriers. Please note that non-smart chip credit cards are not accepted at vending machines. The premium ticket for Paris visitors ! Enjoy unlimited travel with all public transport services in central Paris (zones 1-3) or alternatively in the entire city + greater Paris (zones 1-5, incl. CDG and Orly airports, Versailles, Disneyland, Fontainebleau,…). For any journey outside central Paris (using the RER or Transilien) you must purchase an Origin-Destination ticket (″Billet Origine-Destination″ or ″Billet Ile-de-France″), the price of which is calculated from station to station. Ticket to use for your journey between Paris and the airport (if you don’t have a valid Paris Visite travelcard zones 1-5). • Bus, except Orlybus and Roissybus. Ticket to use for occasional travellers and visitors not wishing to use the Paris Visite travelcard zones 1-3. Purchase a book of 10 tickets (″carnet″) and save on the price of buying 10 individual tickets. Standard ″ticket t+″ is not valid between Paris and the airport.